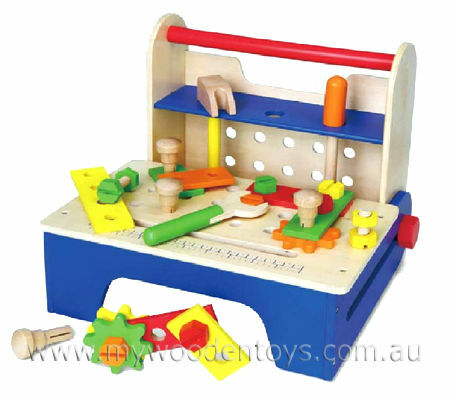 Wooden Folding Tool Bench is a strong well designed 32 piece work bench with all sorts of tools, cogs and accessories to keep your little builder happy and engaged. This tool bench all folds into a handy carry case so you can move your tools to wherever a job needs doing. This set come with phillips screwdriver, hammer, wrench, 3 gears, 6 hole connectors, 4 nails, 8 bolts and 8 nuts. We like this because: "Tool box, work bench, tools and construction all in one."